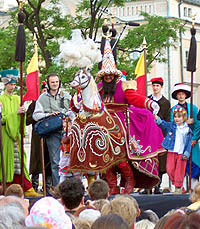 There are over fifty culture festivals in Krakow, Poland every single year. Some of them have been held for decades, some are relatively fresh calendar entries. Below see the list of events with the biggest following. As the day dates keep changing you can look up details in the site’s EVENTS section. February: International Sea Song Festival Shanties, Festival of the Theaters for Children, International Percussion Festival. March: Bach Days (Johann Sebastian Bach’s Festival), Audio Art Festival, PROGRESSteron Festival for Women, OFAFA Poland’s Festival of Auteur Animated Film. April: International Festival of Krakow Composers, PaKA Cabaret Review, Off Plus Camera International Independent Cinema Festival, International Piano Duet Festival Duettissimo!, Cracow Theatrical Reminiscences International Theater Festival, The Old and The Young International Jazz Festival. May: Krakow International Film Festival, Krakow Month of Photography Festival, Orthodox-Church Music Meetings, Juwenalia Student Festival, Festival of Children Song, Krakow Film Music Festival, Cantate Domino International Choir Festival..
June: City of Krakow Festival, Selector Festival /electronic music/, Art Boom Visual Arts Festival, Summer Opera Festival, Krakowiak International Festival of Children's and Youth Folk Band, Jewish Culture Festival. July: Festival of Polish Music, Sinfonietta Festival, Summer Jazz Festival, International Street Theatre Festival, Tyniec Organ Recitals, Benedictine Monastery Music Festival, Summer Organ Concerts, 'Cracovia Danza' Festival of Court Dances, Summer Festival of Opera and Operetta, 'Crossroads' Festival of Traditional Music, PyroMachina International Gala of Pyrotechnics Art. August: ‘Music in Old Krakow’ International Festival, International Competition of Modern Chamber Music, Coke Live Music Festival, Folk Art Fair, Puente del Tango International Festival of Argentinian Tango, Tyniec Organ Recitals, Summer Organ Concerts, Krakow Harvest Festival. September: Sacrum-Profanum Festival (classical music), International Guitar Festival, Bajt Chadasz - Jewish Culture Month, Krakow Jazz Fall Festival, Young Artists in Krakow Festival, Podgorze Cultural Autumn, Galicja International Festival of Chidren's Films. October: Unsound Festival /electronic and experimental music/, Genius Loci Theater Festival, International Royal Cracow International Piano Festival, 7xGospel Festival of Gospel Music, International Ethnic Television Festival, Student Song Festival. November: ‘Zaduszki’ (All Souls) Jazz Festival, All Souls Organ Music Festival, Cracow Jazz Fall international festival, Krakow Book Fair, Joseph Conrad Literature Festival, Etiuda&Anima 2007 Festival of Student Films, Krakow OFFBallet Meetings. December: Krakow Christmas Crib Contest, The Divine Comedy festival of the Polish theater, ‘Jazz Juniors’ International Competition of Young Jazz Bands, Festival of Silent Film. 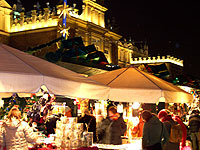 The Christmas market in Krakow starts at the end of November. Every second year: International Festival of Military Bands (the nearest one in June 2016). Every third year: International Triennial of Architecture (the nearest one in October 2018). Every third year: International Print Triennial (the nearest one in September and October of 2018).